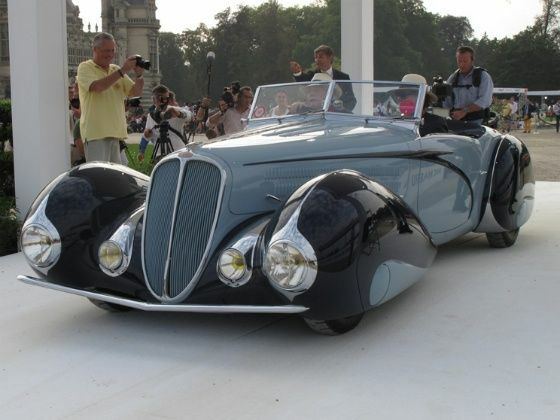 Peter Mullin's beautiful Delahaye 135 with Figoni & Falaschi coachwork, won the Best of Show at the 2014 Chantilly Art & Elegance concours in Paris. A car of Indian provenance, the stunningly beautiful Delahaye 135 with Figoni & Falaschi coachwork, owned by famous American collector Peter Mullin, won the Best of Show at the first Chantilly Art & Elegance concours near Paris on September 7, 2014. This is probably the first time that a car of Indian provenance has ever won the top prize at a top level concours d’elegance competition internationally. But then this beautiful car, the Delahaye 135, which spent most of its life in India, is indeed a very deserving winner, what with a shape and style that makes it one of the most exclusive and flamboyant of all automobiles ever made. Conceived by Sylviane and Patrick Peter of Peter Auto to revive the true tradition of the concept of rewarding the design of beautiful cars, the first edition of the Chantilly Art & Elegance Richard Mille combined the gems from the finest of classic and vintage car garages and collections across the globe with an array of exciting modern day concept cars and one-offs. With the intention of developing a top level European concours competition and bettering the world famous Pebble Beach do, Patrick Peter has designed the Chantilly Art & Elegance event along the lines of a pre-war gathering of the most beautiful of hand-built cars, with women dressed in matching haute couture wear from leading Parisian fashion houses, such as Paco Rabanne, Thierry Mugler and the recently in-vogue On aura tout vu, amongst others. The lieu itself was stunning: the Chantilly chateau, completed in 1882 (though some bits go back to the 14th century) and the adjoining Les Grandes Ecuries stables (dating from 1740), with the beautifully designed gardens and water bodies surrounding the chateau, is unmatchable for sheer class and elegance, providing for a fantastic setting that gave enough space around each car on display, bringing out the best of each design and showcasing the workmanship and the quality of restoration. With over a hundred cars competing in ten different classes, ranging from cars built before December 31, 1904, to up-to-the-minute concept cars, including the stunning DS Divine concept from PSA Peugeot Citroen, which had its world premiere at Chantilly, the 40 judges had a difficult time choosing the winners of each class and the overall Best of Show. But then the judges – ranging from luminaries such as Rahim Aga Khan, French philosopher and ex-Minister Luc Ferry, Alfieri Maserati and Adolfo Orsi, to well known experts like PSA’s design chief Jean-Pierre Ploué, Rodolphe Rappetti, Philippe Gombert and notable Indian automotive journalist and classic car veteran, Gautam Sen – with much debating were able to narrow down the choice to that one Delahaye, one with a strong Indian connection. Commissioned by Indophile Frenchman Paul Jourde, this car was shipped to Bombay in 1939, where it was sold to the Maharaja of Nawanagar. Some years later, the car was acquired by the Maharaja of Jaipur, who seems to have passed it on soon thereafter. The car, in a very poor state was rediscovered by an English dealer, who had the Delahaye, or whatever remained of it, spirited out of India in about 1982. Peter Mullin, an enthusiast of pre-war French cars, acquired the car in 1992, and since then the car has been starring at various shows, the most recent being last February’s Paris Retromobile’s Maharaja Cars special expo, curated, incidentally, by Gautam Sen.